Becoming a parent for the first time is an overwhelming mix of emotions – exciting, frightening, exhausting, bewildering… “What will my daughter do for a career? Will she go to University? Will she get married and how many grandchildren will we have? Will she look after us in our old age?” Many parents’ thoughts, I would imagine. My daughter was born 10 weeks premature and after 1 month in intensive care, she came home. Our first Christmas as a family was magical, but as March approached my wife and I could sense that something was not right with her. My daughter spent much of her day screaming – not for food, but in a rage. She had stopped giggling and taking interest in her surroundings – she had regressed. Then, when she turned 8 months old, she started seizing, throwing out her arms and legs, her eyes would roll into the back of her head and she would cry after each attack. We videoed her and rushed her to Addenbrooke’s A&E in Cambridge, where she was diagnosed with a potentially fatal form of epilepsy called West syndrome. Thankfully medication stopped her seizures within 24 hours, but the brain damage had already been done. ‘Time will tell if your daughter will ever talk or walk’, we were told. ‘So she may never be able to call me daddy?’ Ex-Prime Minister David Cameron’s son, Ivan, tragically succumbed to a similar type of epilepsy, called Ohtahara syndrome. A few months later we were given a further diagnosis of diplegic spastic cerebral palsy, which appears to be very common in children with West syndrome. My daughter will now need lifelong care and is at high risk of suffering from epilepsy again in later life. We were surprised to find that, overall, relatively little is known about her disease. Cerebral palsy and epilepsy are umbrella terms for a group of diseases defined by similar symptoms, but with many different causes, prognostics and therapies. My daughter’s underlying cause is most likely to be genetic, so she was enrolled in the 100,000 Genomes Project. As part of the process myself and my wife have also enrolled in the project and along with many 1,000s of other families we hope that by taking part we will be able to unravel the genetic cause of our daughter’s condition. Before moving to work for a genomics interpretation company, I worked on the human genome for over 22 years at the Wellcome Trust Sanger Institute, a field that would lend itself perfectly to finding out more about her disease. I launched an international project to investigate genes involved in infantile epilepsy. Amazing open-minded clinicians in the UK and Canada offered their resources and time. New disease causative genes are constantly being discovered, but we wondered whether existing gene structures had been completely catalogued, or whether there may be parts of those genes that are not represented in available databases used to research genetic conditions. My collaboration will support existing epilepsy projects to help identify the cause of disease, predict when future seizures may occur, identify therapeutic interventions when they become available and potentially reduce the need for further stressful and sometimes invasive procedures, with associated cost savings for the NHS. I decided to move to work for a genomics interpretation company because I wanted to work for a company that has a direct impact on children such as my daughter. In time, the work we do will help establish if a child has a de novo (new) mutation, or not. If it is a new mutation the risk of recurrence is low. Our work will also establish prenatal diagnosis for future children and tailor treatments, based on a disease defined by a gene’s sequence. If an early diagnosis can be made for children at risk before they experience symptoms (in my daughter’s case before she had her first seizures which caused brain damage), it might be possible to identify potential ways of reducing syndrome development. We are now adapting our garage to be her ground floor bedroom and bathroom. Hoists will assist her to use her bed, bath, and toilet when she is older and too heavy for us to lift. “Who will look after her if mummy and daddy are gone? 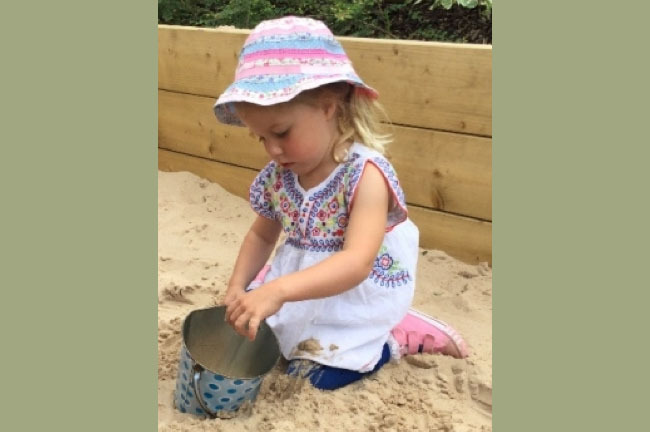 Will her siblings have the same disease?” Taking part in the 100,000 Genomes Project may help to secure a diagnosis, and the anxiety of not knowing why our daughter is ill would be greatly reduced, even if currently there is little therapeutic treatment. And my daughter? As a direct result of the incredible medical intervention by the Addenbrooke’s clinicians, she has just celebrated her 4th birthday, can count to 10 in German and English and say, mama and daddy!